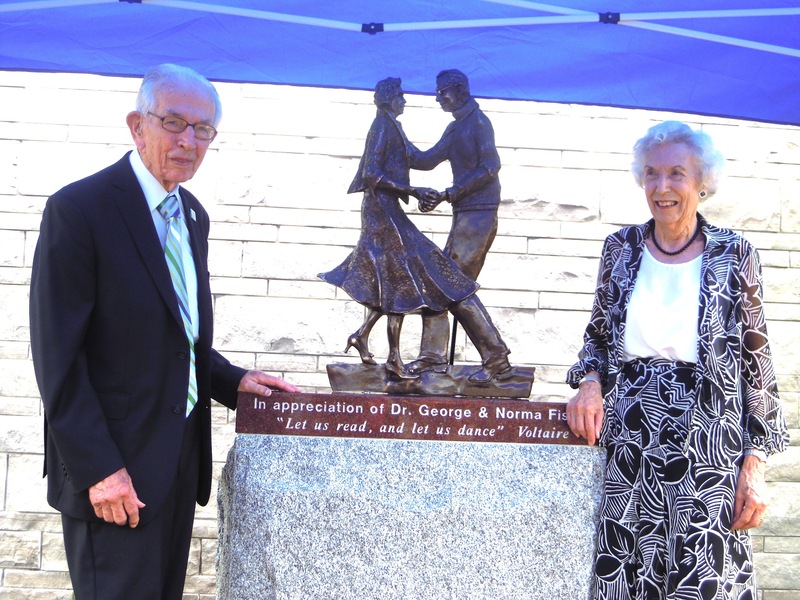 EMC News – A sculpture in tribute to community leaders Dr. George and Norma Fisher will see them forever dancing in the town they love and have called home for 43 years. The program room at the North Grenville Public Library (NGPL) was filled to the brim Aug. 11 as the community came out to help the library unveil a sculpture in the Fishers’ honour. Friends, family and government representatives were on hand for the special event, of which NGPL board chair Jim Armour served as emcee. His involvement in Rotary International has taken him around the world and he has seen firsthand how others live. The idea to pay tribute to the Fishers came in 2008 when then-Advance reporter Chris Hofley made mention of their community involvement in his farewell column. When the Fishers were named honourary co-chairs of the NGPL’s Room to Read campaign in 2010, it became clear some way to honour the couple was needed. Ottawa-area artist Rosemary Breault-Landry created the 35-inch tall sculpture, which features the Fishers in an often seen pose: dancing. She began work on it back in the winter and once it was perfected, Gary Briggs was tasked with casting the statue in bronze. Kevin Allen of Eastern Ontario Monuments also provided the granite on which the sculpture sits. Leeds-Grenville MPP Steve Clark, who credits the Fishers with inspiring him in his own involvement with his local Rotary Club, said they are an inspiring couple. It’s that active role they have played in their community that makes the tribute to the Fishers so fitting, Clark said. “You’re a testament to what an active citizen should be in our community and I truly believe your legacy will be and will always be how you’ve helped build this community of North Grenville,” he commented. Referring to Norma as the Ginger Rogers to George’s Fred Astaire, Clark shared a quote about how Rogers did everything Astaire did but backwards and in heels. “So thank you as well to Norma and to both of you for being an inspiration to me,” he said. North Grenville mayor David Gordon echoed Clark’s comments, calling the community blessed to have the Fishers among its residents. “George and Norma were always the mentors of the community and the builders of the community,” he said. Councillor Barb Tobin presented the Fisher with a certificate of recognition for their leadership and for being ambassadors of North Grenville. She said a piece of artwork is great way to honour the couple. Leeds-Grenville MP Gord Brown couldn’t be in attendance for the statue’s unveiling, but Armour read a brief note expressing his congratulations. “Your lives reflect the values we should all strive to meet in our own lives,” he stated in his remarks. Armour noted that the Fishers serve as examples of how all North Grenville citizens should live their lives. He said they have served their community with purpose, partnership and passion.